Westport Country Playhouse’s world-premiere drama, “Thousand Pines,” brings the national dialogue about gun violence to the stage from October 30 through November 17. Written by Matthew Greene and directed by Austin Pendleton, the new play was part of the Playhouse’s 2017 New Works Circle Initiative, a program dedicated to the discovery, development, and production of new live theatrical works. “Thousand Pines” is a story of common humanity, healing, and forgiveness in the wake of a shooting at Thousand Pines Junior High School. As three families gather months later, on Thanksgiving Day, they are united in their grief and determination to move forward. Matthew Greene, playwright, stated, “The families portrayed in ‘Thousand Pines’ are lost. They're grieving, they're hurting, and they're desperately confused. But in the midst of this darkness they learn a lesson that I think resonates with all of us: the only thing we can cling onto in these times of extreme crisis is the people we love.” Greene will participate in panel discussions about the play’s theme on Monday, October 29 and Sunday, November 11 at the Playhouse. The three families in “Thousand Pines” are The Fosters, The Kanes, and The Garrisons. 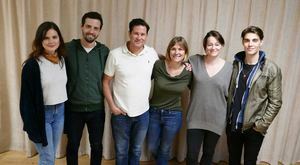 The family members are played by six actors in a variety of roles. The play is set in the dining room of three identical suburban tract houses over the course of a Thanksgiving dinner.